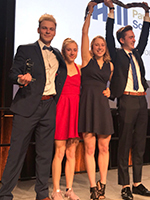 By Greg Duck Posted: January 18, 2019 10:00 a.m.
With tremendous effort from all 52 competitors, the Hill School of Business continued their winning streak by achieving a third place finish at the 2019 JDC West competition. Under the leadership of co-captains Braedon McLeod and Melanie Lehrer, and faculty advisor Randy Linton, nearly a year of work paid off this past weekend. A show of team spirit at opening ceremonies. An impressive 3,590 volunteer hours were completed for local charities by the Hill team. First place Social Team accepts their trophy (l to r) Misha Tsymbal, Robyn Ham, Jana Ham, and Andriy Tkach. 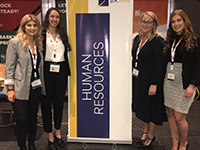 The first place Human Resources Team (l to r) alumni coach Nicole Pyne BBA’18, with team members Rebecca Taylor, Kaitlyn Buzak, and Megan Mann. The three-day business student competition was held in Burnaby, British Columbia and hosted by Simon Fraser University from January 11-13. JDC West features undergraduate student teams from 12 top universities. Each team divides itself into sub-teams to tackle competitions in parliamentary style debates, 10 academic disciplines, athletics, and a social competition that puts reality television shows to shame. 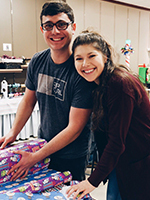 Unique to JDC West is its emphasis on school spirit, goodwill, enthusiasm, and community involvement – all which contribute to a team’s placing. 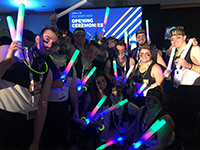 “We are so proud of how the Hill School of Business team showed and portrayed the absolute best of the school on one of the biggest stages – you couldn’t help but root for them!” said Lehrer. Team accomplishment highlights included placing first in both volunteer hours and participation. Since beginning team activities in May, 3,590 volunteer hours were completed within the community for an average of nearly 70 hours per team member, and more than $24,500 was fundraised for Hope’s Home (the team’s monetary charity). They also sorted 41,437 items for the Regina Food Bank. “The volunteer hours and funds raised prior to the team heading to Burnaby for the larger JDC West competition, helped our community partners and, at the same time, helped us create a bond within our team that served us well at the competition,” said McLeod. For a school to place in the top three overall, typically, many sub-teams will podium at the competition. Even though only two sub-teams names were called during the awards gala, McLeod knows that all other competing Hill sub-teams must have finished very close to the top in order to help achieve the team’s overall placing. “There weren’t that many individual sub-team placements, but that speaks even more to the fact that as a group everyone’s effort contributed to the overall finish,” said McLeod. 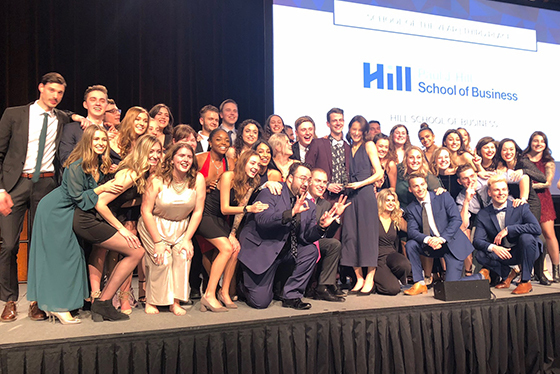 Over the course of the 14-year competition, Hill has developed into perhaps the most consistent school, having placed in the top three in nine of the past ten competitions – an unprecedented record. Much of the success is due to the support the program receives from the University, sponsors, faculty members, and alumni and business community members that help to coach teams. “The support we receive year over year is incredible and the main reason we are able to be so consistent and help us to place so well,” said McLeod. Congratulations to the entire Hill team on an impressive showing! It was announced in August that the University of Regina will be the hosts for 2020 edition of the competition.